Sugar workers in Guyana came out in thousands to demand wage increases. 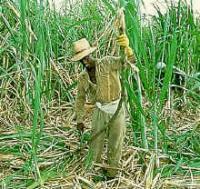 The Guyana Sugar Worker's Union is demanding automatic wage increases for sugar workers to compensate for the introduction of a 16% value added tax starting in the new year. Around 14,000 Workers from sugar cane fields and factories, had their second day of strikes on Wednesday, and belong to the country's most powerful labour union. The strike is due to be postponed today in order for negotiations between workers and management to take place. Kormal Chand, a spokesperson for the union, has said the strikes will continue if the State-owned industry fails to come to an agreement with the workers. The sugar industry is Guyana's biggest employer, and has been hit hard by recent pressure from the WTO which forced the EU to drastically cut it's subsidy system, which gave African and Caribbean countries preferential access to European markets in a bid to stimulate development. The 14,000 strikers come from a population of just 767,000 people.